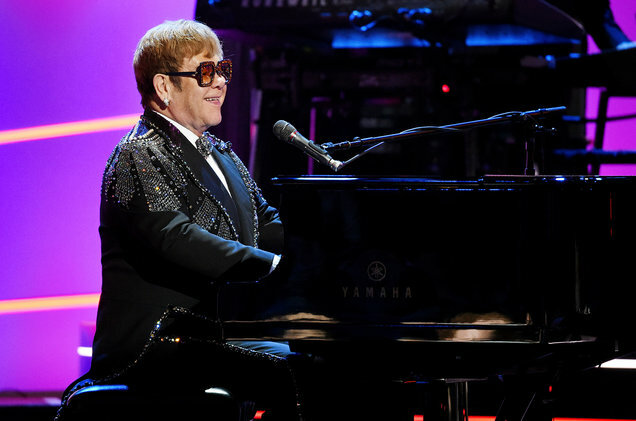 Elton John has announced a two-year farewell tour, is further canonized in a two hour TV special “Elton John: I’m Still Standing – A Grammy Salute” (CBS, 9 p.m.), an event taped when a lot of performers were around for the Grammys last month. A roster of mostly contemporary performers pay tribute with his songs, including Lady Gaga, Miley Cyrus, Miranda Lambert, John Legend, Ed Sheeran, Sam Smith, Kesha, Little Big Town, Alessia Cara, Chris Martin, Shawn Mendes, Maren Morris and SZA. That’s meant to give him some 21st Century relevance, but John is perfectly capable of doing the best renditions of his songs himself. A seventh and final season begins for “New Girl” (Fox, 9;30 p.m.) one of broadcast TV’s most reliable comedies. It adopts that convenient final season contrivance, jumping in time as Jess and her roommates are three years in the future in an inconceivable time when Jess and Nick are returning from European book tour but not yet married; eveybory else sees to be paired up: Schmidt and Cece are hosting their daughter’s birthday party and Winston and Aly are married and expecting their first child. It will take a lot for you to want to sit down and watch another two hours of Trump, but a new “Frontline” (PBS, 10 p.m.) lays out exactly how Republican leaders fell in line behind a leader who had no interest or patience for policy while having a soft spot for white supremacists. Puppies and adoption are subjects on “Roseanne” (ABC, 8 p.m.). A dog is the issue on “Blackish” (ABC, 9 p.m.) as well. The musical is getting some revision on “Rise” (NBC, 9 p.m.). Lena prepares for a first date on “Splitting Up Together” (ABC, 9:30 p.m.). “LA to Vegas” (Fox, 9 p.m.) goes in for flight training. Tobias seeks to capture “Black Lightning” (The CW, 9 p.m). “America’s Next Top Model” (VH1, 8 p.m.) crowns a winner. A peanut brittle sale becomes a problem on “The Middle” (ABC, 8:30 p.m.). “Greg Davies: You Magnificent Beast” (Netflix, streaming) is a new stand-up comedy special. Contestants are divided into teams on “The Voice” (NBC, 8 p.m.). “Deadliest Catch” (Discovery, 9 p.m.) returns for a new season. The nature of being a hero is discussed on “The Flash” (The CW, 8 p.m.). “Secrets of the Dead” (PBS, 8 p.m., check local listings) tries to find where Hannibal crossed the Alps en route to attacking Rome. The new legal drama “In Contempt” (BET, 10 p.m.) concerns a public defender in New York City. “Lethal Weapon” (Fox, 8 p.m.) goes after a hitman. An exorcism may be needed on “Chicago Med” (NBC, 10 p.m.). David meets his oldest enemy on “Legion” (FX, 10 p.m.). Mandatory minimums are a problem on “For the People” (ABC, 10 p.m.). Amy throws a baby shower for Audrey on “Little People, Big World” (TLC, 9 p.m.). The three couples go on second honeymoons on “Married at First Sight” (Lifetime, 9 p.m.). Turner Classic Movies features Jane Powell in five of her MGM musicals, “Two Weeks with Love” (8 p.m.), “A Date with Judy” (10 p.m.), “Hit the Deck” (midnight), “Nancy Goes to Rio” (2 a.m.) and “The Girl Most Likely” (4 a.m.). Baseball includes Yankees at Boston (ESPN, 7 p.m.) and Oakland at Dodgers (MLB, 10 p.m.). NBA action has Boston at Washington (TNT, 8 p.m.) and Houston at Lakers (TNT, 10:30 p.m.). Soccer has Liverpool at Manchester City (Fox Sports 1, 2:45 p.m.) opposite Barcelona at Roma (Fox Sports 2, 2:45 p.m.) in the UEFA Championship quarterfinals. Women’s college lacrosse has Maryland at Princeton (ESPNU, 6 p.m.). Kelly Ripa and Ryan Seacrest: Jon Hamm, Louie Anderson, Patrick Reed. The View: Madeleine Albright. The Talk: Zooey Deschanel, Lorena Garcia, Mo Rocca. Harry Connick: Rick Springfield, Page Turner, Deron Jenkins, Jace Norman, Joey Thurman (rerun). Steve Harvey: Steve Martorano, Ali Fedotowsky Julissa Bermudez, Garcelle Beauvais. Ellen DeGeneres: Eva Longoria, Colin Hanks. Wendy Williams: Vivica A. Fox. Stephen Colbert: James Spader, Katie Couric, Louie Anderson. Jimmy Kimmel: Eva Longoria, Sebastian Maniscalco, Daniel Caesar with H.E.R. Jimmy Fallon: Jon Hamm, Emily Ratajkowski, Khalid & Normani. Seth Meyers: Timothy Olyphant, Wyatt Lenac, Gil Sharone. James Corden: Reba McEntire, Lucy Hale, Glenn Howerton, Kelsea Ballerini. Carson Daly: Zach Braff, the Oh Hellos, Harris Dickinson. Trevor Noah: Mariska Hargitay. Jordan Klepper: Gregory T. Angelo. Conan O’Brien: Hilary Swank, Zach Woods, the Lone Bellow.